The Avila Eagles, an NAIA program that competes in the Heart of America Conference, has a large Southwest Missouri representation. The teams record is 3-8-1 overall and 0-4 in the Conference right now. Guillermo Zuniga (Nixa 2008) has played in nine games, scoring in two of them, both wins. He’s tied for 3rd in scoring for the team this year. Danny Curro (Nixa 2007) got into his first game of the season against William Jewell on September 30th. Hugo Morales (Camdenton 2007) has played in three games, scoring a goal in the 2-0 win over William Penn University. Justin Varner (Waynesville 2008) has played in 2 of the last 3 games. His brother Kyle is a junior on the Waynesville Tigers squad. 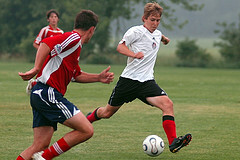 Patrick Allen Turk (Joplin McAuley 2005) has played in 12 games, scoring a goal in the 3-4 loss against Ottawa University. Chase Slaughter (Carl Junction 2005) has played in 8 games this season, getting off 4 shots on goal. The Missouri Valley Vikings, also a member of the Heart of America Conference, are relying on a trio of dynamic women from Southwest Missouri and a budding freshman goalkeeper from Central HS. The team is 3-7 this season, 1-2 in the Conference. Jessica Yach (Nixa 2007) has played in all ten games this season, scoring 6 with an assist for 13 points, #2 for the Vikings. Regina Bodine (Willard 2007) has also played in all ten games, with one assist from her defensive position. Patricia Middleton (Willard 2008) has played in all ten games with one assist. Dessa Loveland (Central 2008) has played in 4 games this season, behind the Vikings senior goalkeeper. Abby Ussery (Kickapoo 2008) is a red shirt this year. Chealsey Russell (Kickapoo 2008) got her second straight start for the Owls on Sunday against Memphis, a 0-1 loss that was also broadcast on CSTV Sunday. She was recently featured on the Rice Owls women’s soccer website, in their “Just for Kicks – Meet the Owls” section. My favorite nugget of information from the interview? I’m not sure what to think 🙂 Oh, and she’s started 5 of 6 games now that she is healthy again. Region II Soccer Tournament: Springfield SC Advances To Semi-finals Again! The Springfield SC U17’s shut out Northwest Indiana FC 1-0 today, winning on a goal by Brock Ruggeri (Kickapoo HS, pictured at last years Regionals vs FC Milwaukee). When combined with the KC Wizard Juniors loss to FC Barrington by the same 0-1 score, our local boys advance from the group to reach the Region II semi-finals for the second straight year. The team has now scored 6 goals while only giving up 1 in the tie to the Wizard Juniors yesterday. Missouri puts both U17 Boys teams into the Semi-Finals as Scott Gallagher SC, who lost in the semi-finals of the Missouri State Cup but advanced with a Midwest Regional League (MRL) wildcard (16 teams from 13 states qualified for Regionals). Gallagher went through on tie-breakers with a better goal differential. Scott Gallagher sends their U13, U15, U17, U18 and U19 boys teams into the Final 4, the KC Wizards U19 Boys team qualified and St Louis SC qualified two girls teams. Chealsey Russell’s (Kickapoo/Rice) St Louis SC U18 advanced to the semi-finals, going 3-0 and outscoring their opponents 8-3 in the process. The U13 Girls team also advanced. Good news from Rockford where the U17 boys won their opening game on Saturday 4-0 over the FC Barrington squad from Illinois making their club’s first ever visit to Regionals. Goals were scored by Ryan Partch, Bryce Collier, Ian Kennedy and Devon Newport, continuing the broad-based scoring model that has gotten them this far. Sunday’s opponent is the KC Wizards Juniors who defeated Northwest Indiana FC by a 6-1 score, making the game the key to moving out of the group on Tuesday. Scott Gallagher, who qualified via Midwest Regional play, tied Bangu (MN) 1-1 in their opening group game. Two-time regional champion (2003, 2005) and 2005 national champion (Under-15 Girls), St. Louis Soccer Club Under-18 Girls defeated Javanon (KY) 2:1. I think they are playing without All-Star Chealsey Russell (Kickapoo/Rice) who was injured in the State Final last week. The Missouri State Cup tournament wrapped up last weekend with the U18 and U19 age groups. It’s not the same tournament it was when I moved here in 2002 and a week later spent a week in Columbia with almost 200 teams competing to represent the state. Unfortunately MYSA has chosen to narrow the field, dramatically, by charging $600 to enter while only guaranteeing a single game. Even the Regional Tournament offers group play but your leadership at MYSA feels that is not in the best interest of their members. The State will be well represented at Regional but I would prefer to see the former model, which creates a great environment and offers the highest participation levels, returned. Until you the members make your voices heard, we’ll have to live with this model it appears. If you’d like to learn more or offer feedback, contact Southern District Commissioner Kelly Ross at Lake Country Soccer. Congratulation to the 2008 State Cup Winners. The Springfield Soccer Club earned their second straight title while Chealsey Russell (Kickapoo) earned her 5th title with her U18 St Louis SC Mller teammates. The Tigers opened the scoring this evening in the 2nd minute, by freshman Jayme Braun, sending a message to their Northern neighbor about what to expect. The Chiefs were able to tie the score in the 37th minute via a corner kick, with Megan Etter scoring on the set piece service by Erica Freiert. The Tigers took the lead again in the second half but the Chiefs were able to rally and tie the score yet again, this time in stoppage time, sending the game into overtime. Two overtime periods were scoreless which led to PK’s. The Tigers won 3-0 when they finished their three chances while the Chief’s first three shooters were blanked. 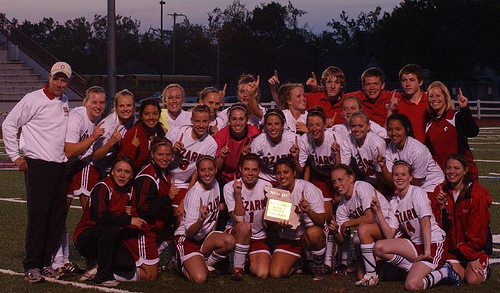 UPDATE – OzarkTigerSoccer.com offers a great read on the game! PS – I was planning on attending but didn’t get home from my business meeting at BPS until almost 6pm this evening. I guess I should have anticipated there might be OT but couldn’t justify the 150 mile round trip for what I thought would only be the final third of the game. I’m sorry I missed it ladies.